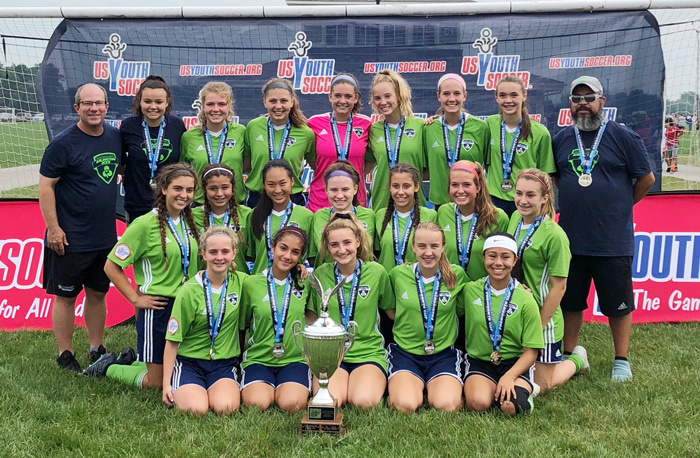 The Arlington Aces U15 girls won the US Youth Soccer National Presidents Cup Championship in a tournament played July 12-15 in Westfield, IN. This championship is the first national soccer championship in the history of the Arlington Aces, which dates back to 1978. The Aces began their journey towards a national championship with their Illinois state competition in the Fall of 2017. The Aces team, made up of mostly girls local to Arlington Heights, placed first in their group and won their semi-final match, on November 5, 2017, and won the Illinois Presidents Cup Championship with a 3-0 score over the Chicago Fire Jrs. Next up was the Presidents Cup Midwest tournament in West Chester, OH from June 14-18 2018. After a tie against SLSG, the state champions of Missouri, the Aces were victorious in their remaining group games against state champions from Ohio (BEES Soccer Academy) and Wisconsin (SC Waukesha). The Aces had tough games in the semi-final and final, winning both games 1-0 over Ames Navy, from Iowa, and the Minnesota Thunder Academy to become Midwest champions. The National Presidents Cup Championships were played July 12-15 in Westfield, IN at the Grand Park Sports Complex. In their first game, against the Eastern Regional champions, HFC Ready (PA), the Aces suffered their first loss in Presidents Cup play, falling 2-1. The Aces bounced back the next day, winning 2-1 over the South Region champions, BSC Cardinal from North Carolina. On the last day of group play, the Aces needed a victory to secure a birth in the national finals. Playing against the West Regional champions, Real Henderson FC, from Nevada, the Aces rolled to a 4-0 victory and a spot in the championship game. In the finals, the Aces faced a rematch of their earlier defeat with HFC Ready. The game was back and forth the entire game until a goal with 7 minutes to play resulted in an Aces US Youth Soccer National Presidents Cup Championship. Leading scorers for the IP Arlington Aces for the national tournament were midfielder Avery Larson (Arlington Heights, Hersey High School) and forward Josie Bieda. Members of the Best 11 for the tournament were Avery Larson, goalkeeper Lilly Collins (Arlington Heights, Saint Viator High School) and Josie Bieda (Downers Grove North).